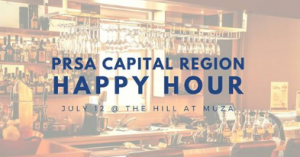 When: Thursday, July 12th from 4-7 p.m.
On July 12th at 4:00 pm at The Hill, join the Capital Region chapter of the PRSA for a wonderful evening of networking as we enjoy the happy hour! Meet professionals and career seekers throughout the Capital Region and join us in casual conversation. Participation in this event is free, but each person is responsible for the cost of their own refreshments.